Where are the area’s most popular speed traps? 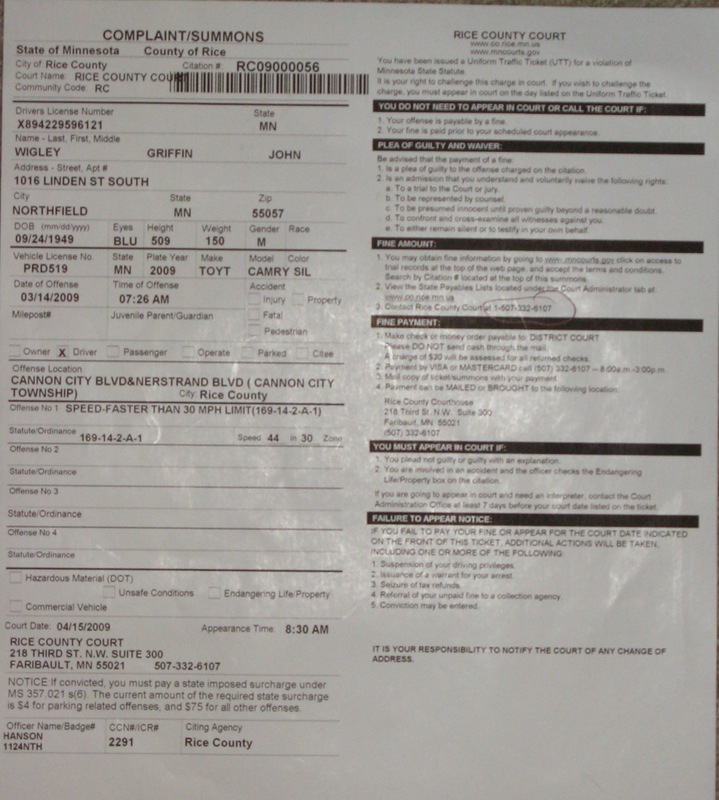 I got nailed for speeding a week or so ago, going 44 in a 30 in the laughably-labeled ‘urban zone’ of Cannon City. (It’s a freakin’ township.) It’s ridiculous IMHO to have the speed set for 30 MPH on County Road 20 as if it were a neighborhood street. Even Dennison, which is a city and has many businesses along County Road 9, has the speed set at 35 MPH through the middle of town. Okay, so it’s cash-cow speed trap, I should have known better since I travel that way to Faribault often, and my fine of $130 helps Rice County’s revenue stream. I’ll get over it eventually. So in the interest of public safety (heh), where are the other speed traps in the area? That area is heavily patrolled and the speed limit is more strictly enforced there because the local residents who live along that road are very vocal about speeders. The cops take a lot of calls from residents complaining about speeders. I don’t think the cops hand out more tickets there to generate revenue, but rather to have a visible presence which will hopefully lead to fewer complaints. hey, instead of hot rodding around in your fancy Silver Toyota Camry, you could slow down and obey the posted limit. I bike there Griff and once you hit Cannon City, it’s residential, kids, balls, chickens. I’ve never seen police there so I don’t know what kind of a trap it is, but slow down. Fankly, I’m sick of people speeding on Jefferson parkway. It’s like the Indy speedway, no stop signs, divided road, gun it mentality. people rarely stop for pedestrians in the crosswalks(it’s the law) and there is one of the city’s largest parks at Jefferson and Maple. what’s the rush? Cannon City is 2-3 blocks long. do the math, how much time would you save driving 44 instead of 30 for 3 blocks? Same with Jefferson pkwy. from Division to the east end it’s like a mile. how much time can be saved driving 40-45 instead of 30? Not much. slow down, smell the roses and admire all Cannon City has to offer. or Drive highway 3. Oh, Griff … you’re not going to get a lot of sympathy on this one! A “speed trap” is nothing but the enforcement of a speed zone, by an entity which has the authority to set the limit. I love to drive the ‘backroad’ to Faribault, but in the 14 years I’ve been doing so, that Cannon City stretch has really grown and has a lot more housing. Let it be a lesson, young man! ( virtual smiley-face ) Pay attention to the ‘guidelines’! Sorry about the ticket, Griff, but I agree with Jerry on Jefferson Parkway — slow down!!! — especially near the park. You were VERY lucky the officer cited you for 14 over. He was actually treating you kindly. In Minnesota, 15 over the limit is considered wreckless driving. It carries with it a mandatory base fine of $210, and can go as high as $700 and up to 90 days in Jail. Be careful, and slow down. It is REALLY easy to get caught unaware. Another spot is highway 47 as it comes to highway 3. The DKS loves this area, as well as hiding in the John Deere Dealership in the mornings (right over the county line). set up by the National Motorists Association. Jeez, I expected a little sympathy here and I’m getting scolded big-time. C’mon, fellow speeders, how about a little support? Obviously nothing but law-abiding, speed-limit watching types out here! Gaylord MN and Dundas MN were awarded by the World Traffic Institute for being number 6 and 17 respectively in the top 100 driving tickets per capita. I saw an empty squad parked next to the Dundas sign the other day. Gee, Mr Henson started April Fools jokes a little early. If one Googles “World Traffic Institute” the only results are references to his comment in this blog. He sure caught me. Here I thought misinformation in a lighter vein on an occasional basis was Griff’s duty. John: Nice try. You just want Griff’s $130.00. Dundas could turn this into a marketing opportunity like Gaylord. They are using the traffic ticket proceeds for a town festival complete with a 3-Ring Flagrancy Circus at the courthouse. And it wasn’t even april fool’s day! Back in the late 80s when I was commuting, I got caught speeding on I-35 near Lakeville by a highway patrol airplane. Two weeks later, I got caught speeding on Hwy 52 near Coates by a highway patrol airplane. True story. Anyone know if they sell radar detector-type devices that can detect highway patrol airplanes? Anyone know if I can download a radar detector app for my G1 Google phone? I’ll be pissed if it’s only available for the iPhone. your Kindle doesn’t have that app? why not save the cash and sloooowww dooowwwnn rabbit? A fellow Northfielder stopped by my corner office at GBM this morning to tell me that he was able to get the cost of his speeding ticket cut in half just by going in to talk to a Hearing Officer in Bloomington. He had to plead guilty and agree that it would still appear on his record, available for his insurance company to see. I remember doing something similar for a ticket I got for not having my license tabs on the front plate of my car. I saw a Hennepin County Hearing Officer for traffic court to argue my case (I was innnocent, of course!) and also got the fee cut in half. covered half of those costs. Call and Check with Community Services Officer Kris Wilson, or the other new CSO. There used to be a class that you could take for locally based speeding tickets. Its 8 hours of goodness with a test, complete with the old Drivers Ed films.